A high-volume aggregate producer doesn’t become a top U.S. producer overnight. A series of growth-related moves are usually made, and those moves are typically made over a period of years, even decades. New Enterprise Stone & Lime Co. Inc., a Pennsylvania-based aggregate producer with more than 90 years of history, has followed that model of periodic growth. Several men orchestrated New Enterprise’s growth over the years, including Paul Detwiler III, the current president and CEO of the family-owned company. Acquisitions increased the amount of materials available to New Enterprise over the years, and Detwiler and his father, Paul Detwiler Jr., were instrumental figures in the growth the company achieved. “Typically, your expansion comes from acquiring somebody else,” Detwiler III says. New Enterprise is regularly active trying to rally support for highway funding. 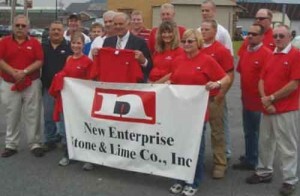 New Enterprise made two key acquisitions in the early 1970s in Martin Limestone, a producer in Lancaster, Pa., and Valley Quarries, which was located in Chambersburg, Pa. The company’s next major acquisition came in 2000, when Buffalo Crushed Stone was brought into the fold. Another major acquisition was made in 2008 with the addition of Stabler Cos. That brought Eastern Industries into the family. The timing of the acquisition, with a recession that soon followed, wasn’t ideal. The recession forced New Enterprise to rethink how its companies were organized. Detwiler III led a reorganization effort about two years ago that resulted in cost reductions, efficiency improvements and top-line improvements such as selling price. Al Stone, who joined New Enterprise more than two years ago as executive vice president and CFO, worked alongside Detwiler III in the reorganization. The company’s reorganization included a significant downsizing. The decision to downsize was a difficult one for the family and not a “typical New Enterprise move,” Stone says, but it was necessary for the company to survive and reposition itself for prosperity. Although Detwiler III’s current role is administrative in nature, his experience with the family business formed in a number of areas. After graduating from Lehigh University, Detwiler III started with New Enterprise in its IT department. He says he worked on the company’s mainframe programming applications, and as PCs evolved, he got involved in those. Also, Detwiler III helped to put New Enterprise online in real time with data circuits during the ‘80s. Detwiler III took over as CFO in the early 1990s and held that position for about 15 years, before taking over as president and CEO. Detwiler III and his father are men his employees enjoy working for, as well. “They’re very creative and very well-liked individuals,” says Kevin Reed, New Enterprise’s executive vice president and COO. Stone agrees that Detwiler III and his father are great people to work for. Detwiler III is a supporter of the greater industry through his efforts with associations, including the National Stone, Sand and Gravel Association (NSSGA). He’s currently the chairman of NSSGA, prioritizing the implementation of Rocks Build America, the association’s strategic plan to rebuild the nation’s crumbling transportation infrastructure, create jobs and drive economic growth. Detwiler III values the national association because of its ability to advocate on behalf of others. 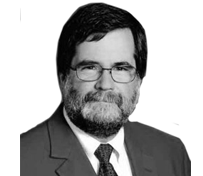 Detwiler III is optimistic about the passage of a long-term highway bill these days because infrastructure is actively parts of decision-makers’ discussions. According to Barley, Detwiler III’s involvement in NSSGA ultimately benefits New Enterprise.